In the hours and then days following the attack on the World Trade Center, Mayor Rudolph Giuliani ran through dust-covered streets overseeing the emergency; praised, mourned, and promoted firefighters; gave visiting politicians tours of the smoldering wreckage. But from the beginning the mayor has done one thing above all that has won him the gratitude of New Yorkers. He has vowed that the city will recover. "We've undergone tremendous losses, and we're going to grieve for them horribly," said Giuliani, "but New York is going to be here tomorrow morning, and it's going to be here forever." The rubble has not yet cleared, the lists of the missing are still growing, but the mayor remains forceful in his faith in the city's future. "We're going to rebuild," he said. "We're going to come out of this stronger than we were before. Emotionally stronger, politically stronger, economically stronger." What will happen to the local economy? How will insurance companies cover the losses to businesses and individuals? Where will businesses find new office space; can they all be kept from leaving the city? Should the World Trade Center be rebuilt? If so, how? If not, what would take its place? How will the newly elected officials - the primary is rescheduled for next Tuesday! -- lead the recovery and rebuilding of the city? What environmental impacts, health concerns, and transportation problems will linger into the future? If these questions have no firm answers, there are questions we do not even know enough yet to ask. A comprehensive list is impossible to amass, since New Yorkers are only beginning to comprehend what the city was hit with, and what it will have to do to recover. Congress has approved $40 billion in federal aid, about half of which will go to New York City. But we are only beginning to calculate the price of recovery. At least half will go to relief efforts in disaster zones. $10 billion immediately goes to efforts to counter terrorism, to increase transportation security and fund recovery and cleanup efforts. $10 billion made available after a 15-day period once the White House gives Congress a spending plan. $20 billion included in spending bills for fiscal year 2002. The House approved payments to families of killed or injured firefighters, police, medics and other rescuers: $150,000 - $180,000 each. 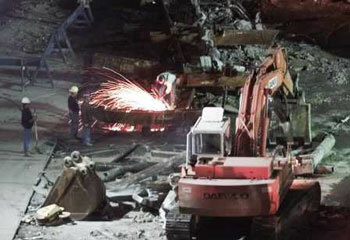 Clearing rubble from crash sites: $100 million per week. Replacing the WTC's towers: about $4.5 billion. Repairing the Pentagon: about $1 billion. THE END OF BOOM TIMES? The terrorist attack on the World Trade Center were not only an assault on the United States, but on the financial heart of the city and the nation. And in large part, it was successful. The New York Stock Exchange closed for the longest time since the Great Depression. The twin towers housed 50,000 employees and many of the additional 50,000 workers in the surrounding area have also been displaced. The area of lower Manhattan accounts for as much as 20 percent of the city's wages, according to the business web site Economy.com. "I think there will be an enormous economic jolt," said Alair Townsend, a former city budget director and publisher of Crain's New York magazine. City officials now estimate that the World Trade Center attack could cost the city $3 billion in tax revenues from loss of income, property, and businesses by the end of the fiscal year. The city is making efforts to ease companies and their employees toward recovery. The Empire State Development Fund set up a center to help businesses cope with losses, get loans, and gather information on the status of buildings in lower Manhattan. The mayor is urging financial firms and companies to stay in Manhattan, promising that there is enough available office space, and that New York will "emerge better than it was before." And the federal government has also moved to salvage the national economy. The Federal Reserve cut interest rates, purchased an unprecedented amount in government bonds, and extended credit lines to companies around the world that do business in New York. The city will also receive $20 billion in federal aid from Congress, which some promise will be just a first installment. Even with all of these efforts, experts agree the city's and the nation's economy is teetering. "The economy was struggling mightily to keep its head above water before this event," said Carl Tannenbaum, an economist at LaSalle Bank/ABN Amro, who was in a hotel ballroom near the World Trade Center during the attacks. But there are also those who say the financial district has weathered recessions, the World Trade Center bombing eight years ago, and even an attack on Wall Street in 1920 that killed 38 and wounded 300, and it will survive again. "What is striking is the amazing persistence and continuity of the financial industry," said business historian Ron Chernow. "Wall Street has repeatedly demonstrated its resilience and defied predictions of its demise." However, it is not just Wall Street that governs the city's economy. The economy is also dependent on a sense of confidence by other businesses, as well as employees, tourists, and consumers. The attack directly affected not only those businesses whose employees worked in the World Trade Center, but the taxi cab drivers, couriers, coffee stand owners, window washers, and restaurant workers whose livelihood depended on the center. Many of these live and spend their paychecks in the outer boroughs. And 38 million tourists visited last year, a record number, in part because they have come to think of New York as a relatively safe place. Will as many visit next year? Amid his press conferences, services for victims, and testimonies to the heroics of firefighters, even Giuliani recognized the urgent need for people to get out of their houses, away from the television, and back to "normal" life. A few days after the tragedy, the mayor urged tourists, and even New Yorkers, to go to Broadway and take in a show. While the smoke that rose from the Twin Towers' tragic collapse has started to dissipate the questions and concerns about its impact on public health and the environment will linger long after the smoke has cleared. Some experts have said that it is simply too soon to know what kinds of hazardous materials emerged from the fires that blazed atop the towers and the structural crumbling that followed. Jet fuel, insulation, plastics and other synthetic materials all burned in the fire and were carried off in a cinematic black pillar of smoke; much of the gray dust that has wafted into the air and covered the streets nearby likely consists of gypsum board and pulverized concrete. Asbestos fibers loose in the air and buried in the rubble pose the most immediate continuing risk, and the relief workers and volunteers at the scene are the most likely to suffer its short- and long-term affects, according to Dr. Lester Blair, president of the American Lung Association of New York. "Those people need to know how much exposure they've had," said Blair. Any exposure to asbestos can have adverse health affects, including lung disease and, potentially, cancer; such effects are unlikely to show themselves for 20 years or more. The more intense and the more prolonged exposure one has had, however, the more likely it is that one will be affected. Inside the area where the World Trade Center once stood the U.S. Environmental Protection Agency has found asbestos levels as high as 4.5 percent of the total sample taken. The latest samples have shown asbestos at or below one percent, which is considered the background level for asbestos. Tests are also being done to assess rescue workers' potential exposure to silica, a mineral used in buildings that has been linked to lung cancer and tuberculosis when it becomes airborne. Tests outside the ten-block radius, in Brooklyn and Staten Island, have not found elevated levels of asbestos, lead, or volatile organic compounds. "The good news for the residents of New York is that the air, while smoky, is not dangerous," said Environmental Protection Agency spokesperson Tina Kreisher. "There are dangers of smoke from the fire, of course, but it is not something we would classify as toxic." Still, people who have breathed in even traces of the smoke have complained of burning eyes and irritated throats. The EPA's 24-hour air quality testing inside the impact area will continue for some time. Yet, while they may not be toxic, strictly speaking, smaller particles inside the smoke, known as particulate matter, pose a long-term policy issue the city will still have to confront. Particulate matter, a product of power plant and vehicle emissions, penetrates past the upper bronchia of the lungs and lodges deeply in the air sacs, causing asthma, chronic bronchitis and other lung diseases. The EPA has passed new, strict standards for particulate matter, but the standards have yet to be implemented in the city, an area notorious for its soot problem. Regulators and politicians will now have to consider the additional smoke that has been unleashed in the area, as well as the pollution that already exists. The catastrophic events also set in motion a series of actions designed to ensure the city's water remain clean. Shortly after the terrorist attack, city, state and federal officials heightened security at upstate and in-city reservoirs. In addition, the city has increased testing of its drinking water supply, according to Charles Sturcken, chief of staff for the New York City Department of Environmental Protection. "There are about 1100 sampling stations around the city and starting Tuesday we were taking an increased -number of samples," said Sturcken. The Department of Environmental Protection has stepped up water quality monitoring at its sewage treatment plant in Washington Heights, as well. "Most [pollutants] would have gone into sewers," said Sturcken. Because the area immediately around the Trade Center was evacuated, Sturcken continues, much of the sewage system there has not been used, reducing the risk of overflow directly into the Hudson River or New York/New Jersey Harbor. Whether or not the sewage system around the Trade Center has itself been wrecked, however, is still being investigated. Certain portions of lower Manhattan are still without water service. The Department of Environmental Protection is also working with Coast Guard to check for any oil spills into the Hudson and the harbor. Such spills are most likely to come from infrastructures and underground fuel storage tanks crushed or broken when the buildings fell. A LACK OF OFFICE SPACE? The World Trade Center alone accounted for 2.6 percent of the total office space in New York. CoStar Group, a real estate firm, estimated that more than 27.5 million square feet of office space has been lost in the area, an amount roughly equivalent to all the office space in downtown Los Angeles. Yet remarkably, much of lower Manhattan, although damaged and dusty, is still intact. Many buildings like the World Financial Plaza and 1 Liberty Plaza, which are structurally sound, will need repairs to the lobby, offices, and windows. Real estate analyst Jonathan Litt of Salomon Smith Barney said their building "will likely not be fully operational for up to one year." Experts said that it could take months simply to determine whether a number of other buildings have sustained lasting damage. Once that is decided, work can begin. In the meantime, the scramble for new office space is on. Jay Spiver of CoStar told Crain's that, if all the tenants in the World Trade Center stayed in Manhattan, the vacancy rate in the borough would drop from 7.4 percent to 4.3 percent, forcing companies to pay more rent or accept lower quality space. In light of this, Businessweek concluded, "Sadly the only sector that could actually benefit from the disaster is real estate." That, though, is for the short term. Many taking a longer view fear the catastrophe will damage New York's economy and the real estate market along with it. While the city is striving to keep companies and jobs in New York, some firms desperate for space immediately are moving outside downtown Manhattan, most notably to Jersey City. "The chances of tenants moving back to downtown are slim," said Whitley Collins, of the real estate firm CB Richard Ellist. Officials may have to get creative about how to keep businesses in the city, such as the use of incentives to get them to stay. Other possibilities include using space like Governor's Island. Robert Pirani, environmental director of the Regional Plan Association, said the federal government should look seriously at how the island can be used in the short term to aid in the city's recovery from the tragedy. "It is not without its logistical difficulties," said Pirani, who noted that the island has 500,000 square feet of office and commercial space and 1200 residential units. The island has been well maintained by the General Services Administration since the Coast Guard closed the base in 1996. Pirani cautioned, however, against immediate needs replacing a planning process for what is right for the island in the long term. "We don't want this to become the de facto plan," he said. However, without something, New Jersey and other states may benefit from New York's loss. Insurance claims from the September 11th tragedy are already piling up. The New York Stock Exchange has insurance. So do thousands of small businesses, individuals, airports, rental car companies, the Port Authority, and sports teams like the Yankees and the Mets who suspended play for nearly a week. Lehman Brothers has estimated the total claims may reach $30 billion, but that amount could still rise higher. Before this, the largest insurance calamity in U.S. history occurred in 1992 when Hurricane Andrew amassed over $16 billion in claims. Businesses connected to New York and Washington are already claiming lost income and relocation expenses of more than $10 billion dollars. So far there seems to be some good will in an industry known for long and contentious legal battles over insurance claims. Some feared that insurance companies would refuse to pay out claims, because many policies exclude damages suffered in an "act of war." However, several insurance companies, like Chubb Corporation and the American Council of Life Insurers, have already said they will not apply the war provision. And the Association of Trial Lawyers has called for a moratorium on civil lawsuits related to the attacks for the time being. The Port Authority of New York and New Jersey, which owns the World Trade Center, said that its insurance would cover the economic loss to the agency. It also expects to be able to make payments on its $6 billion in bonds through revenue from airports, bridges and tunnels, bus terminals and its "substantial reserve funds." But if, and how, the World Trade Center and the surrounding area should be rebuilt, is a task that will have to be argued and financed for many years to come. "The World Trade Center towers were not instantly lovable or easily cherished buildings," Tony Hess wrote in the New York Times the Sunday after the attack. But now that the towers are missing many want them replaced almost immediately, probably as much to mend the city's psyche as the eerie hole in the skyline. "I want to rebuild them exactly as they were," said former Mayor Ed Koch in a television interview. Mayor Giuliani remarked that "the skyline must be made whole again," and Senator Charles Schumer called for "something grand" at the site. ""Both towers have to be brought back," said Henry Guthard, the partner of trade center architect Minoru Yamasaki. "These are not just office buildings. They are icons of America." Larry Silverstein, who holds a 99-year lease on the trade center, would like to oblige. "It would be the tragedy of tragedies not to rebuild this part of New York City," said Silverstein, who added that the new buildings might not be as tall as their predecessors and the site would include a memorial to the victims of the attack. "The images of the destruction of the World Trade Center and the horrific accounts of the suffering of those trapped on its highest floors may very likely give rise to a backlash among people fearful of finding themselves in a similar situation," according to Mark Lewis of Forbes magazine. "Clearly, these buildings cannot be rendered invulnerable to terrorist attack. The taller they are, the more they stick out, and the more they stick out, the more likely they are to be targeted." THE SUBWAY BACK ON TRACK? Less than a week after the attacks, the Transit Authority issued a new subway map. There are missing N and R lines, fewer stations below Chambers Street, and the 1 and 9 train ends at 14th Street rather than South Ferry. This will be the new map, officials said, at least for the next few months. But that does not mean they will be permanent. Some of the train stations in lower Manhattan were not damaged, but have closed following the disaster only because some feared rumbling subways could create problems for the rescue crews above. So much debris clogged the Cortlandt Street stations that the Transit Authority feared it had caved in. But David Cacoilo, an engineer who explored the tunnels, said he thought the station seemed to be in good shape. But still the N and R lines between Canal and Whitehall Streets will be out of service for weeks. The E stations in the World Trade Center, along with PATH service into the station, remain closed. And on the 1 and 9 lines stations collapsed partly because columns and beams from 7 World Trade Center punctured the street and entered the subway. For a city that has not built a new subway line in over 60 years and has been hoping for a Second Avenue subway since the 1950's, even getting the transportation system back to the way it was before September 11, will be a daunting task. Two days after the attack, the New York City Council called a special session in an ornate room in the main branch of the public library in Midtown. The meeting was solemn and the business specific. By a vote of 46 to 0, the council agreed to remove the borrowing ceiling of the Transitional Finance Authority, a body comprised of the mayor, comptroller, speaker of the city council, the director of the Office of Management and Budget, and the director of the Department of Design and Construction. The measure enabled money used for reconstruction of the city to be backed by the federal government rather than local income taxes revenues. Although it was largely a procedural measure, it marked the first of many responsibilities to come as the city government tries to facilitate the recovery of New York. "There is going to be an amazing amount of work in the next months," said Jordan Barowitz, a spokesperson for Council Speaker Peter Vallone. "The council will have to deal with land use issues, and tax abatement for businesses. And the federal money that comes into the city will have to go through the council to be distributed." It is a weighty amount of responsibility for the City Council, which will lose 37 of its 51 current members, including Speaker Vallone, on December 31 to term limits. The city will also have a new mayor, comptroller, public advocate, and four new borough presidents. To aid in recovery, the city has set up an emergency commission that has the authority to speed demolition and building permits, condemn dangerous property, and expedite the land-use process. Council Speaker Vallone said the council would amend the City Charter to give the commission "extraordinary powers to redo and rebuild and to do whatever's necessary." But just who the next mayor, comptroller, public advocate, and many city councilmembers -- who will all be responsible for continuing the recovery and rebuilding off the city -- will not be finally decided until the November general election. Once in office, many of these politicians who have campaigned on issues of better education, improving transportation, and helping poorer New Yorkers prosper, may find themselves forsaking their plans and trying to keep the city from going bankrupt.